Being the third time that we have exhibited at this prestigious event, we are feeling more like old marine regulars rather than the new kids on the block, dishing out advice to the first timers and swapping stories with other regulars. And by once again thinking outside the square, we managed to impress even the most discerning critic with our innovative display. Two FAB Docks stood upright with the floor becoming the roof; made for one amazing tent. 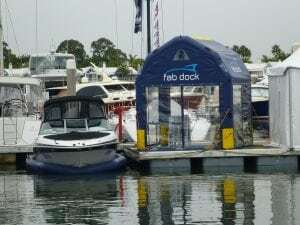 Our new tent with a two year old FAB Dock in the foreground. This new display, combined with some nice weather, a more positive atmosphere in general around the boat show and years of hard work and dedication to perfecting the FAB Dock, led to the most amount of sales that we have ever taken at any boat show. 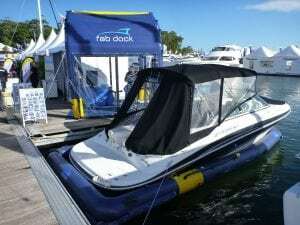 It is great to hear that many people have seen our FAB Docks in canals and marinas during their boating excursions and specifically came to our stand to ask questions about it. When we are up against the best dry docking systems available in the world, all showcased within a stones throw of each other, and people continually tell us that not only are we a half or one third of their price, but we also have a much better product, it reinforces what we have been trying to achieve since our inception. So I apologise to all those people who I have not yet been able to get back in touch with regarding a FAB Dock for their boat, but will do my best to do so over the coming weeks. Look out for us at all the other major boat shows around the country throughout the year or back here again next year.